With the winter months upon us, a huge number of people worldwide will be dusting off their salopettes and waxing their skis ready for a season on the slopes. In fact, it is believed that between them, they rack up over 400 million skiing days per year globally. That’s a lot of man hours in the snow. And with nearly 2,000 alpine skiing resorts around the world, skiers aren’t short of destinations to try. But whether you are a novice first-timer or an avid regular, sound preparation and good safety principles are a must. Even though skiing isn’t perceived as the most dangerous of sports, like any high impact physical activity, it comes with an inherent risk of injury. For many, this is simply wrapped up as part of the adrenalin rush. But it shouldn’t be taken with a pinch of salt and a few good planning tips and safety observations can go a long way towards a safe trip to the slopes. It is believed that for every 1,000 enthusiasts a day, around three of them will require medical attention. And this is not just about a lack of ability; about 10 per cent of all accidents result from a collision with another person or object, 5 per cent are lift related and 5 per cent are due to equipment failure. So injuries are going to happen; they are inevitable in a sport involving hordes of winter athletes racing down a snowy piste. Not surprisingly, the most common types of injury in skiing are to the knee. This is because the body position, speed and changes of direction involved make the knee vulnerable; accounting for 30-40 per cent of all skiing injuries. Whether this be ligament damage, a twisted joint, fractures or dislocations, they are likely to require medical attention as well as a degree of after-care. And then there’s shoulder injuries. These are slightly less likely and often a result of falling badly or landing awkwardly. Again, the injuries are likely to be bone or ligament related and can include rotator cuff strains, broken collarbones or dislocated shoulders. In addition, damage to the spine can be extremely serious too. This is mainly due to the speed involved on the slopes; the faster you go, the more traumatic the force on your spine if you have an accident. It can be as simple as jarring or twisting the spine and surrounding soft tissue to more severe spinal cord injuries. Falling or self-correcting to avoid a fall can cause stress and strain to the spine, but a more serious back injury is likely to occur as a result of a high speed, high impact collision; albeit rare. In all of these types of skiing injuries, the symptoms are likely to be visible almost instantly with pain, swelling and a restricted range of movement. Early assessment of any type of bone or ligament injury is essential to a speedy and successful recovery. Initial investigations will look to diagnose the problem and, in some cases, treatment in the form of rest, fitting of a brace and an anti-inflammatory injection may be enough. For others, however, a more detailed exploratory investigation may be required in through an x-ray, ultrasound or detailed MRI scan. This, in particular, can highlight the most complex of conditions – meaning your treatment plan is very specific and targeted at the exact source of your injury. Even better, an open MRI scan can allow an anti-inflammatory injection to be placed at the very core of your injury, sometimes meaning the difference between being able to move and not. There are also some ski-related injuries, particularly fracture or ligament related, where further intervention is required. This may be in the form or minor or major surgery, but the long-term effects are likely to be lessened, the sooner the diagnosis is received. This will also prevent other injuries developing as a result of your body over-compensating for any length of time. 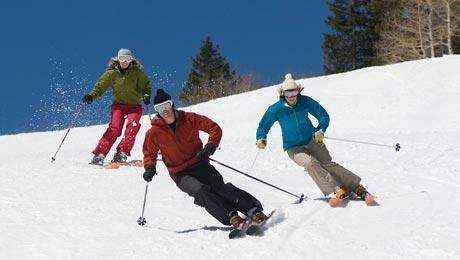 In essence, skiing places great mechanical stresses upon the musculoskeletal system, which inevitably brings a high number of orthopaedic injuries. At Avicenna clinic, we have a range of specialist consultants, treatment rooms for non-surgical procedures and superior in-house imaging facilities – including state-of-the-art MRI, ultrasound and X-ray scanning equipment. We can assess and diagnose all snow sports injuries quickly and deliver comprehensive treatment plans tailored to you.